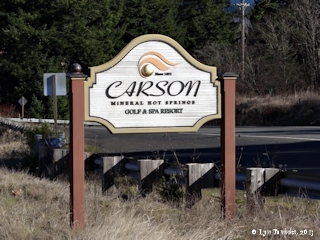 "Hot Springs along the Columbia River"
Click image to enlarge Sign, Carson Mineral Hot Springs Golf and Spa Resort, Carson, Washington. Image taken February 15, 2013. Moffetts Hot Spring, today the location of the Bonneville Hot Springs Resort north of North Bonneville, Washington, has water temperatures of 89.6°F. There is the usual amount of natural gas contained in mineral waters, but no trace of either vegetable or animal matter. The temperature at the springs is 96 degrees. The Cascade Mineral Springs are located in the shade of giant forest trees, on the Washington side of the Columbia river, between the Middle and Upper Cascades, about a mile back from the river bank, and the sparkling water bubbles up from several crystal springs so favorably located that there is no possible chance of contamination. The springs can be reached twice a day by steamer; and, when a new hotel is erected, the O.R. & N. Co. have signified a desire of placing a transport service from Bonneville to Moffett's Landing. This will add six trains a day to the transportaion facilities of the springs. When the location is considered it seems more than probable that the Springs are fed direct from nature's crucible that burns beneath the snowy capped summit of Mt. St. Helens, where all the earth properties of nature are boiling, bubbling and burning in chaotic state, and through the little channels of which the springs are the vent holes, comes flowing almost boiling water, impregnated with curative powers unequalled by the science of physic. Indian tradition, handed down from tribe to tribe, says: "Ages ago pilgrimages were made to this treasure-spot -- for as such it was known -- by the different tribes, and ere the advent of the white man, the Rogue Rivers, the Chitcoes, the Calapoias, Klamaths, and even the Makahs, or water Indian of the coast, brought their aged and decrepit, via the "Bridge of the Gods," to this fabled fountain of youth." 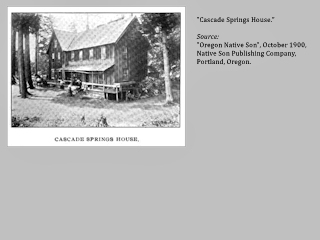 Click image to enlarge HISTORICAL ILLUSTRATION: "Cascade Springs House". Source: "The Cascade Springs", IN: "Oregon Native Son", October 1900, Oregon Native Son Publishing, Portland, Oregon. From its early beginnings the spring changed ownership and even name when the town changed from Moffetts, Washington to North Bonneville in 1934. It also saw several episodes of growth including the building of a new hotel in 1932 to replace the original structure that had been destroyed by fire. 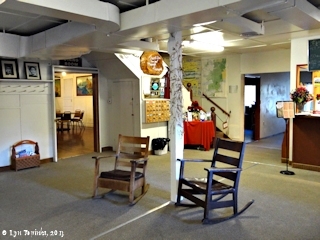 Sub-sequent development included the addition of a dozen cabins and a 38-acre campground with 75 electrical hookups. 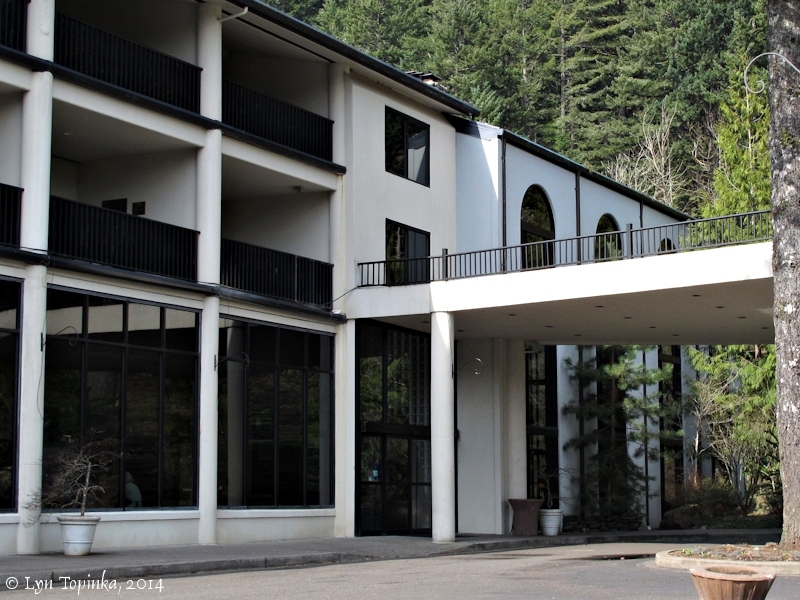 The rebuilding of the Bonneville Hot Springs Resort on the site of the original 1881 Moffett Hot Springs Hotel continues over a century of geothermal use in this scenic area of the Columbia River Gorge. ..."
Source: R. Gordon Bloomquist, Washington State University Energy Program, Olympia, Washington, 2006, "Bonneville Hot Springs Resort, North Bonneville, Wa. ", GHC Bulletin, December 2006. "It wasn’t until 1880 when European settler, R.J. Snow, discovered the springs here at Bonneville and told his friend, Thomas Moffett. Moffett, who quickly recognized the value of our waters, built Cascade Springs Hotel in 1881, and in 1885, started selling the water for 10 cents per bottle. Researchers, such as renowned chemist J.H. Fisk and the US Chemical Assayers from Washington DC, performed numerous chemical analyses of the waters and all agreed that the mineral content in these waters have potential good health qualities. News of this spread quickly and people from all across the country came to drink and bathe in the waters that could help with their kidney complaints, liver problems, dyspepsia, rheumatism, dropsy or general debility. 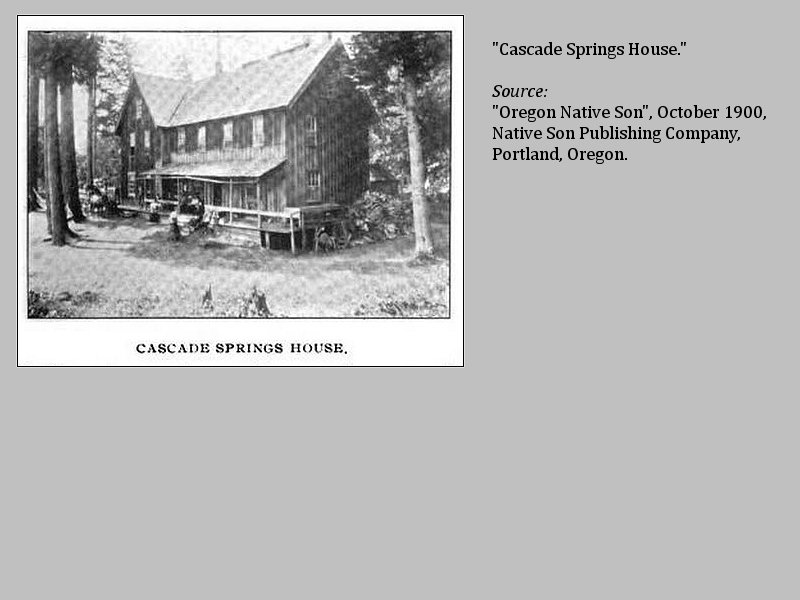 But in the early 1930’s, a fire destroyed Cascade Springs Hotel. 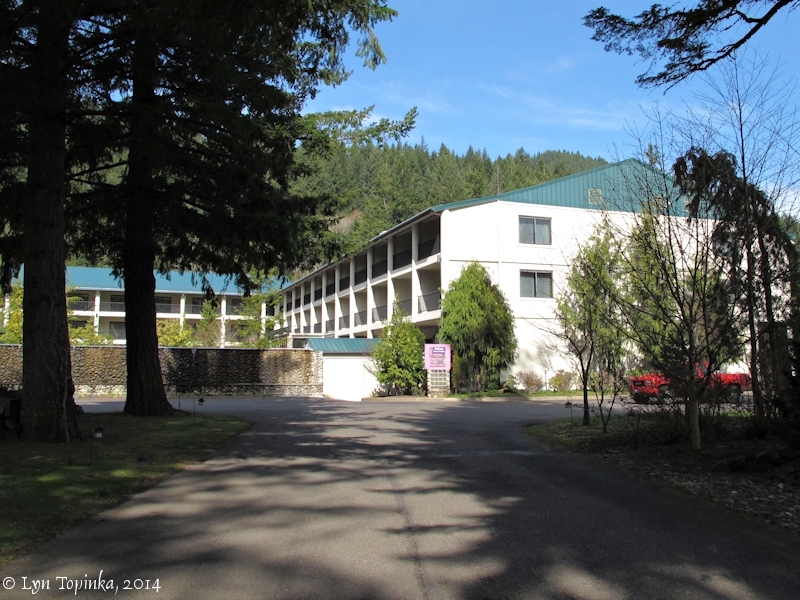 Under new ownership, a new hotel was built in 1932 and was given the name Biba Hot Springs. It included a dozen cabins and a 38-acre campground with 75 electrical hookups. However, by the 1970’s, there was little remaining of the glory days of the 20’s and 30’s. Only a few cabins remained and the entire facility was in disrepair. It was during this time that current owner, Pete Cam, first visited Biba to find relief for his severe case of rheumatoid arthritis in his legs. After a week of soaking, he was able to walk on his own and to this day Pete still soaks in the mineral water daily and continues to enjoy good health…on his own feet. Pete bought this property in 1989 and over the next 13 years worked to create a getaway place for people to enjoy the healing waters. 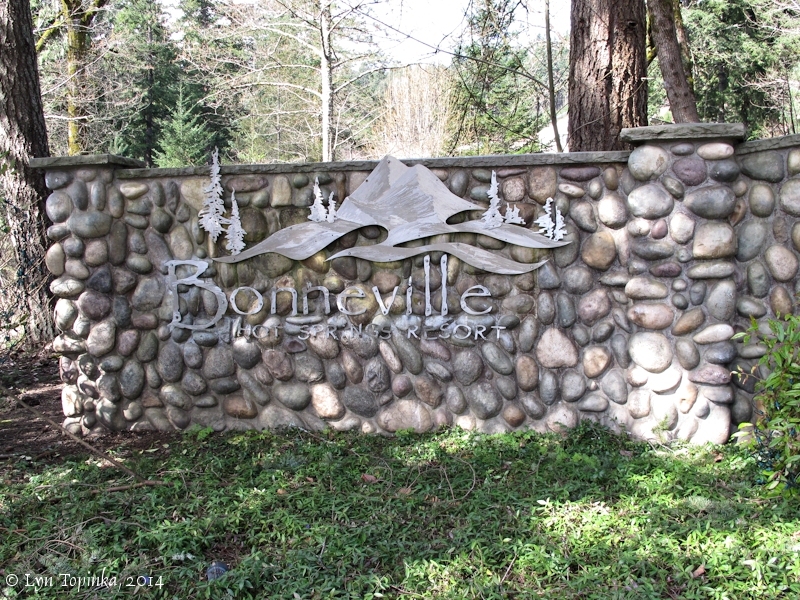 On October 26, 2002, Bonneville Hot Springs Resort and Spa opened its doors for the first time. Since then we have seen countless guests use our waters for health, healing and wellness." Source: Bonneville Hot Springs Resort and Spa website, 2014. Click image to enlarge Penny Postcard: Moffetts Hot Springs, North Bonneville, Washington. Penny Postcard, ca.1930s, "Moffett's Hot Springs - North Bonneville - Wash." Smith. P-821. In the private collection of Lyn Topinka. Click image to enlarge Bonneville Hot Springs Resort, North Bonneville, Washington. Image taken March 21, 2014. 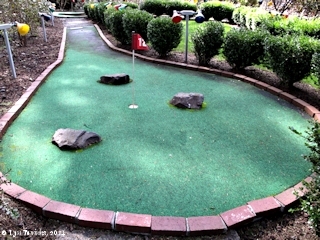 Click image to enlarge 12th tee, Bonneville Hot Springs Resort, North Bonneville, Washington. Image taken March 21, 2014. St. Martin's Hot Spring, today a part of the Carson Mineral Hot Springs Spa and Golf Resort, located northeast of the Washington town of Carson, has water temperatures of 120°F. According to the "Sunday Oregonian", October 8, 1911: "The Martins and the Shipherd Minerals Springs are within one mile of Carson, and the Government Springs are one mile away." "Carson Hot Springs were discovered in 1876 by Isadore St. Martin. While on a hunting expedition with a friend, St. Martin noticed steam along the river and found the hot springs bubbling up among the rocks. They marked the spot and St. Martin later filed an Indian Homestead claim on the site. St. Martin took his wife, Margaret, who suffered from neuralgia, to the hot springs. News of her relief spread rapidly and people began to arrive in great numbers to bathe in the springs. Those early bathers navigated up the Wind River to the original bathhouses. In 1897, St. Martin began construction of the Historical Hotel, completing it in 1901. 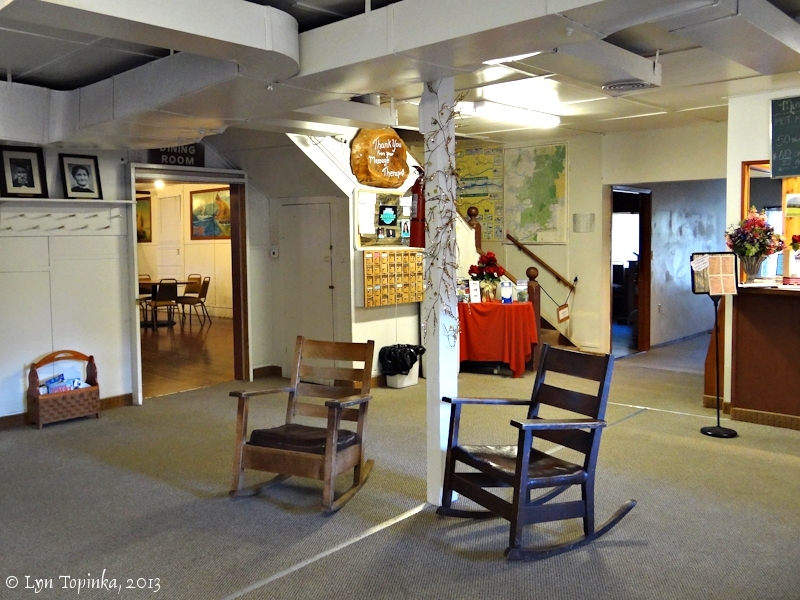 The cabins and bathhouse were added in 1923 and are still being used." 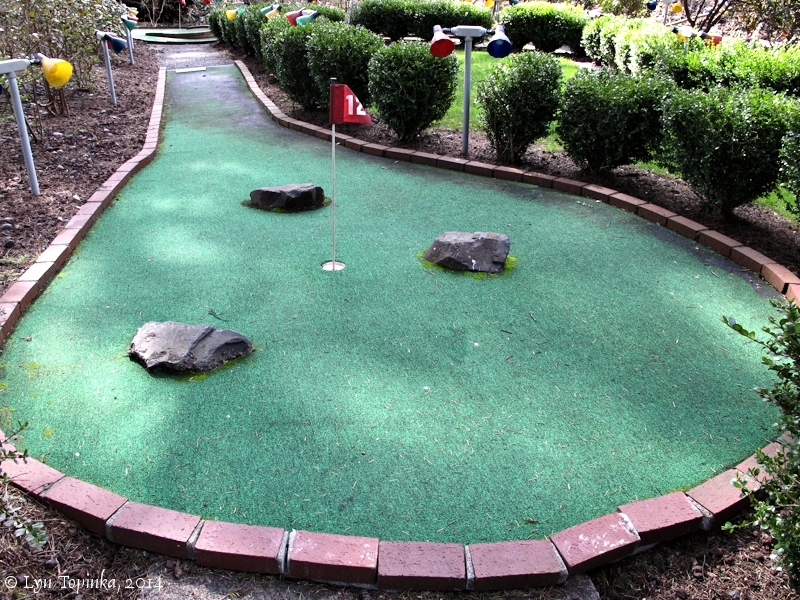 Source: Carson Mineral Hot Springs Golf & Spa Resort website, 2013. "Isadore St. Martin spent his boyhood at home, assisting his father in clearing and cultivating the land until the early '60s, when he went to The Dalles, Oregon, and engaged in packing supplies to the mines at Canyon City. In this work he used a large string of pack horses, and, being a great lover of horses, maintained a splendid outfit. He lived at The Dalles until the spring of 1873, when he came to Skamania county, Washington, and took up a homestead six miles east of Stevenson. The land was covered with heavy timber, and after building a log house, he began the task of clearing the place, for which purpose he used oxen, hauling his logs to the Grant & Stone sawmill at Sprague, Washington. In the course of time he got a goodly part of the land cleared and he carried on its cultivation with success. On this land are fine medicinal hot springs, which he realized were of great value if properly utilized. To this end, he began to advertise their location and value, erecting cabins, tents and other accommodations, and met with such encouraging success that in 1898 he erected a large hotel and a number of bath houses, cleared off and beautified the surrounding grounds, and developed the place into one of the most attractive resorts in the northwest. St. Martin Springs, as the place is now widely known, has been patronized by thousands who have here found an ideal place to recuperate under pleasant and inviting environment, and the springs are patronized by people from all parts of the northwest and California, Mr. St. Martin continued to give the ranch and springs his personal attention until his death, which occurred March 10, 1910, and was deeply regretted not only by the people of his immediate community, who had found him to be a man of worthy life and dependable character, but also by many of his former guests with whom he had formed lasting friendships. " Source: The S. J. Clarke Publishing Company, 1928, History of the Columbia River Valley From The Dalles to the Sea, Vol. III". 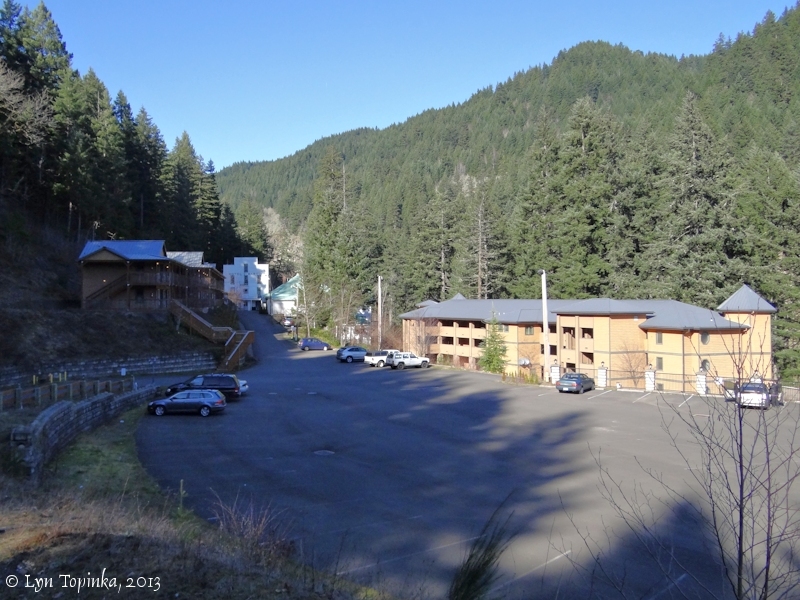 Click image to enlarge Carson Hot Springs Resort, Carson, Washington. Image taken February 15, 2013. 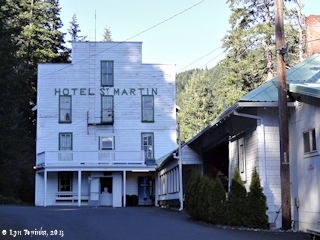 Click image to enlarge Hotel St. Martin, Carson Hot Springs Resort, Carson, Washington. Hotel St. Martin was built in 1901. The bathhouse is the building on the right. Image taken February 15, 2013. 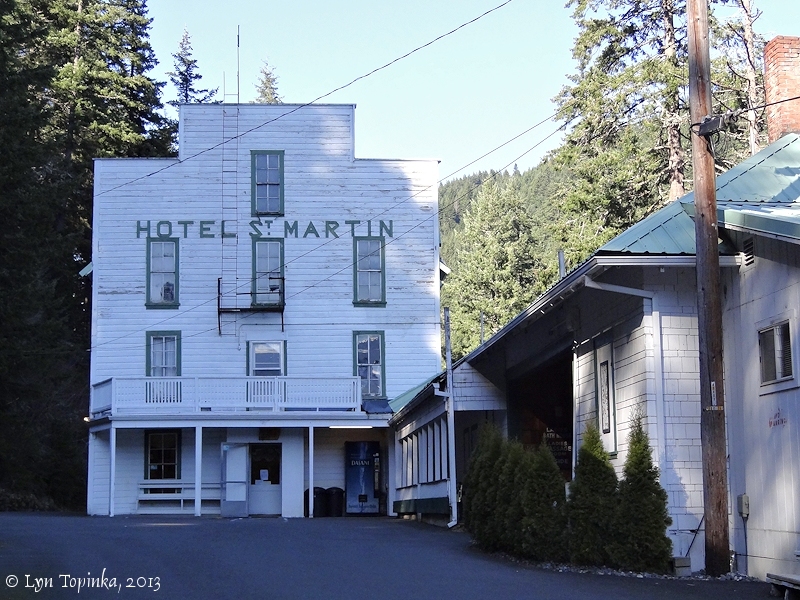 Click image to enlarge St. Martin's Hot Springs Hotel, Carson, Washington. Image taken February 15, 2013. The Collins Hot Spring and the site of the Collins Hot Springs Resort were located near Collins Point, Washington, and today are under the waters of Bonneville Reservoir. The resort boasted spring waters of 120°F. "C.T. Belcher, who at one time was interested with the St. Charles people in developing a hot spring on the old Woodard place on Nelson Creek, has secured a 15-year lease from the O.R. & N. company, contingent upon finding within 90 days the vein of hot water at the Collins springs above high water mark. This Mr. Belcher is trying to do. If he succeeds he intends to put up a $15,000 hotel and bath house. -- Pioneer." Source: "Hood River Glacier", Hood River, Oregon, February 6, 1903, courtesy Historic Oregon Newspapers, University of Oregon Library Archives, 2015. Well-Equipped Baths and Modern Hotel Are Located on North Bank of Columbia. "Marked improvements have been made at Collins Springs on the Columbia River, in Skamania County, Wash., and the management has more attractions to offer the vacationist this season than in previous years. A three-story annex to the hotel has been completed and is fitted with all modern conveniences, nearly all the rooms being equipped with private baths. The entire hotel has been remodeled and refurnished ... New bathhouses have been constructed and are supplied with every feature for the convenience of patrons. 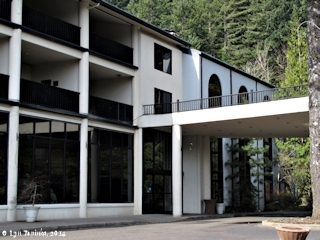 The resort is situated a few hundred feet from the Columbia River and in addition to the boating facilities on the river, aquatic sports and fishing are enjoyed on the three small lakes above the springs. A gasoline launch has been placed in commission and rides up and down the river are provided. The North Bank road passes through the property, the station being but two blocks from the hotel. The waters of Collins Springs have medicinal qualities which, in addition to the restful surroundings, make the resort attractive. The estate is equipped with an electric lighting plant and at night the place is illuminated like the business district of the city. ..."
Source: "The Oregonian", Portland, Oregon, June 11, 1911, courtesy Historic Oregon Newspapers, University of Oregon Library Archives, 2014. Click image to enlarge Penny Postcard: Collins Hot Mineral Springs Hotel, Collins, Washington. Penny Postcard, ca.1910s, "Hotel at Collins Hot Mineral Springs, Collins Wa." In the private collection of Lyn Topinka. Click image to enlarge Penny Postcard: Collins Hot Springs Hotel, Collins, Washington. Penny Postcard, postmarked 1913, "Collins Hot Springs Hotel, Collins, Wash." In the private collection of Lyn Topinka. Click image to enlarge Penny Postcard: Veraqnda, Collins Hot Springs Hotel, Collins, Washington. Penny Postcard, postmarked 1913, "Veranda, Collins Hot Springs Hotel, Collins, Wash." In the private collection of Lyn Topinka. Government Mineral Springs was a developed hot springs resort located less than twenty miles north of the Columbia River. "Recreational users were drawn to Government Mineral Springs early in the 20th century, and established informal camping grounds near the Guard Station. In 1910, S.D. 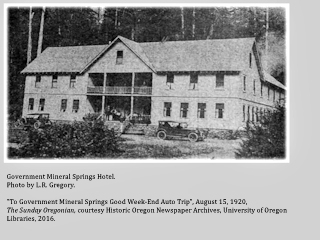 Fox and the Star Brewing Company of Portland began construction of a 50-room hotel at the soda springs near Trapper Creek, which eventually became known as Government Mineral Springs. The popular resort boasted bath houses, Iron Mike Bubbling Springs, a dance pavilion, store, ice cream parlor, goldfish ponds, and flower gardens. Early advertisements for the resort claimed the mineral water spas were capable of curing physical ailments such as gallstones, rheumatism, diabetes and anemia, as well as stomach, liver, kidney, skin, and nervous disorders. In 1935, the hotel burned to the ground. Camping remained popular at the site, and in 1937 and 1938 the Civilian Conservation Corps significantly expanded and developed the public campground. The guard station was built in 1937 by CCC enrollees from Company 944, based at Camp Hemlock, near the community of Stabler. The purpose of the guard station was for Forest Service administration of the campground and other local recreational use. Alfred Albert was the first guard stationed in the cabin. Mr. Albert, his wife, and two children lived at the guard station during the summers of 1937 and 1938." Source: U.S. Forest Service, Gifford Pinchot National Forest website, 2016. Click image to enlarge NEWSPAPER: Government Mineral Springs Hotel, Washington. 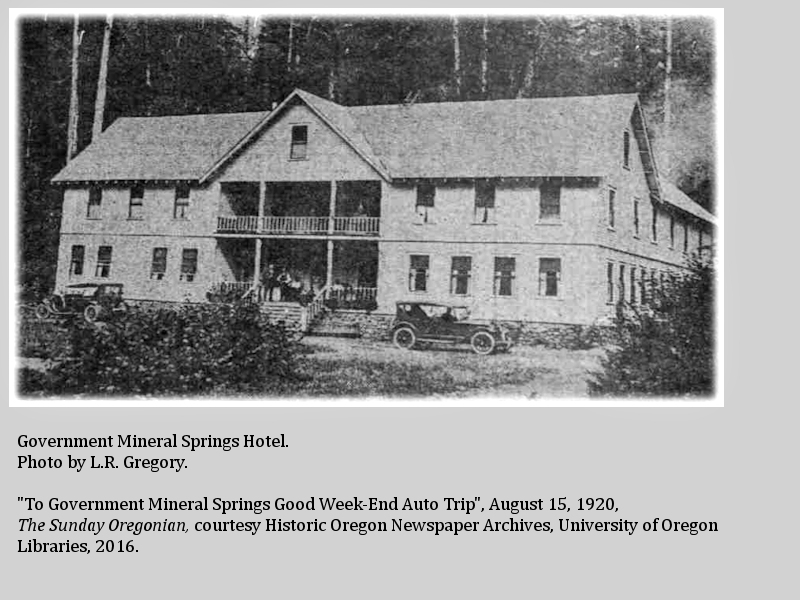 "Government Mineral Springs Hotel", Sunday Oregonian, August 15, 1920, courtesy Historic Oregon Newspaper Archives, University of Oregon Libraries, 2016. Shipherds Hot Springs was located near Carson, Washington. Carson, Wash., "In the Heart of the Cascade Mountains," and build up your health. Fishing, Dancing, Bowling, Quoits, Tennis and Croquet Grounds. Saddle ponies, Tally-ho for fishing and picnix parties. Many nice improvements made during past year. Source: "The Sunday Oregonian", July 12, 1914, courtesy Historic Oregon Newspapers Archives, University of Oregon Libraries, 2016. Amos St. Martin homesteaded 160 acres north of his father's property. In 1911, he built the hotel bathhouses, dance hall, bowling alley and swimming pool. Amos sold his place to a Mr. Shipherd who built the springs known as "Shipherd's Hot Springs". There were 80 acres in this deal. 80 acres were sold to Isadore and Margaret St. Martin, Amos' father and mother. The purchase from Amos was called the Protection 80 acres. It made the St. Martin Springs property 240 acres. The Shipherd's Hot Springs was later bought by a few members of the St. Martin family who operated it until the hotel burned down in December of 1929. The building was never rebuilt." Source: Luther St. Martin, 1987, "St. Martin", Carson Printing. Click image to enlarge Penny Postcard: Shipherd's Hot Springs Hotel, Carson, Washington. Penny Postcard, ca.1900s, "Shipherd's Hot Springs Hotel - Carson, Wash - #148." Undivided back. In the private collection of Lyn Topinka. I was convinced that the hunters must have been up River Cruzatt [Wind River]. despatched Sergt. Pryor with 2 men in a Canoe, with directions to assend Crusats River [Wind River] and if he found the hunters to assist them in with the meat. Jo: Shields returned about Sunset with two deer which he had killed, those were of the Black tail fallow Deer. <the> there appears to be no other Species of Deer in those mountains. We proceeded on 12 miles.